With sadness, the Department of Civil, Environmental and Geodetic Engineering at the Ohio State University announces the passing of Professor Emeritus Tien H. Wu on June 7, 2018. For more than 50 years, he shared his experience, knowledge, and wisdom with generations of students. Professor Wu received his B.S. in civil engineering from St. John’s University in Shanghai, China, and his M.S. and Ph.D. in civil engineering from the University of Illinois, where he was one of Ralph Peck’s first Ph.D. students. He served as a faculty member for 12 years at Michigan State University and for 29 years at Ohio State, from 1965 until his retirement in 1994. He served as chair of CEGE from 1992 – 1994. In addition to these appointments, he held the position of visiting professor at academic institutions worldwide. 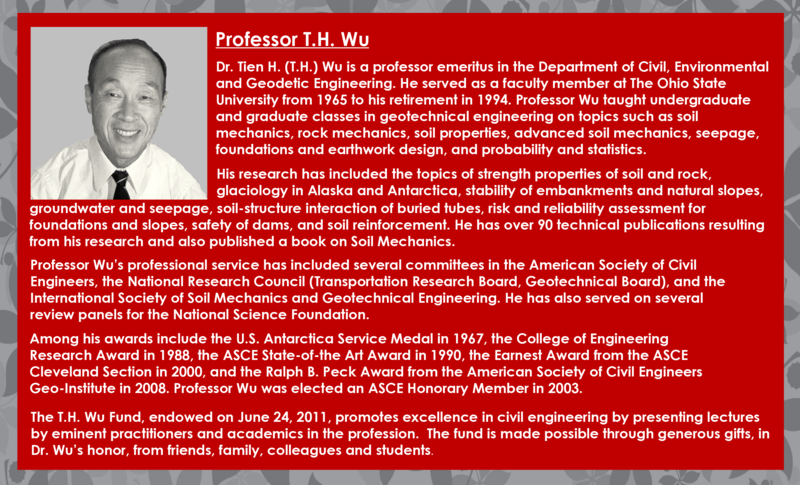 Throughout his exceptional teaching career, Professor Wu led courses in geotechnical engineering, where he addressed topics such as soil mechanics, rock mechanics, soil properties, advanced soil mechanics, seepage, foundations and earthwork design, soil dynamics, and probability and statistics. He remained an active professor emeritus, collaborating with other geotechnical engineers on books and journals. Dr. Wu performed research on the strength properties of soil and rock, stability of embankments and natural slopes, soil reinforcement, and, perhaps most notably, risk and reliability assessments for foundations and slopes. A pioneer in the development and application of probabilistic methods in geotechnical engineering, he studied geotechnical reliability, providing leadership and insight into the probability of foundation safety, safety and hazard analysis of slopes, and uncertainty and decision-making in geotechnical engineering. He amassed over 90 technical publications based on his research and he published books on soil mechanics and soil dynamics. Peers and colleagues consistently recognized Professor Wu’s professional accomplishments. His awards include the U.S. Antarctica Service Medal (1967), the Ohio State University College of Engineering Research Award (1988), the ASCE State-of-the Art Award (1990), the Earnest Award from the ASCE Cleveland Section (2000), and the Ralph B. Peck Award from the Geo-Institute (2008). In 2006, Wu was elected an Honorary Member of ASCE. Wu's professional service included several committees in ASCE, TRB, and ISSMFE. He also served on several review panels for NSF. The Ohio State civil engineering community expresses to the family of Professor Tien H. Wu, its deepest sympathy for their loss. The T.H. Wu Distinguished Lecture is a signature event in the Department of Civil, Environmental and Geodetic Engineering. Presented yearly, the lecture features prominent scholars and practioners in the field of geotechnical engineering. The lecture is held in honor of Dr. Tien H. Wu, professor emeritus and former chair of CEGE. James K. Mitchell Sc.D., P.E.,N.A.E., N.A.S. James K. Mitchell received his B.S. (1951) degree in Civil Engineering from Rensselaer Polytechnic Institute, and his M.S. (1953) and Sc.D. (1956) degrees in Civil (Geotechnical) Engineering from the Massachusetts Institute of Technology. He joined the faculty of U.C. Berkeley in 1958 and held the Edward G. Cahill and John R. Cahill Chair in the Department of Civil and Environmental Engineering (CEE) at the time of his retirement from Berkeley in 1993. Concurrently, he was Research Engineer in the Institute of Transportation Studies and in the Earthquake Engineering Research Center. He was CEE Department Chair from 1979 through 1984. After retirement from Berkeley, Professor Mitchell was appointed in 1994 as the first Charles E. Via, Jr. Professor in the Via CEE Department at Virginia Tech. He became University Distinguished Professor in 1996 and University Distinguished Professor, Emeritus, in 1999. During his career, he supervised the dissertation research of 76 Ph.D. students and authored more than 375 publications, including the graduate level text and geotechnical reference, Fundamentals of Soil Behavior, that is widely used by geotechnical engineers around the world. Over his career, Professor Mitchell has served as a consultant to numerous governmental and private organizations on geotechnical problems and earthwork projects of many types. More recent projects include the evaluation of seismic stability and design of liquefaction mitigation options for Success Dam and Isabella Dam (U.S. Army Corps of Engineers), Folsom Dam (U.S. Bureau of Reclamation), and San Pablo Dam (East Bay Municipal Water District), all in California. He has also served as a member of the Seismic Safety Peer Review Panel for the Bay Area Rapid Transit System and on the ACSE External Review Panel for the Performance Evaluation of Post-Katrina Hurricane and Flood Protection Projects around New Orleans. Among his many honors, Professor Mitchell was awarded the ASCE Norman Medal in 1972 and 1995, the Thomas A. Middlebrooks Award (four times), the Walter L. Huber Research Prize, the Terzaghi Lecture Award, the Karl Terzaghi Award, the H. Bolton Seed Medal (2004) and the 2006 Outstanding Projects and Leaders Award (OPAL) in Education; the Distinguished Teaching Award and the Berkeley Citation from U.C. Berkeley; the Western Electric Fund Award of the American Society for Engineering Education; the Medal for Exceptional Scientific Achievement from NASA; and the 2001 Kevin Nash Gold Medal of the International Society for Soil Mechanics and Geotechnical Engineering. He was the 1991 Rankine Lecturer of the British Geotechnical Society. He was elected to membership in the National Academy of Engineering (NAE) in 1976 and the National Academy of Sciences (NAS) in 1998. Professor Wu discusses geotechnical engineering, academic collaboration and "retirement". Interview conducted in March, 2017.